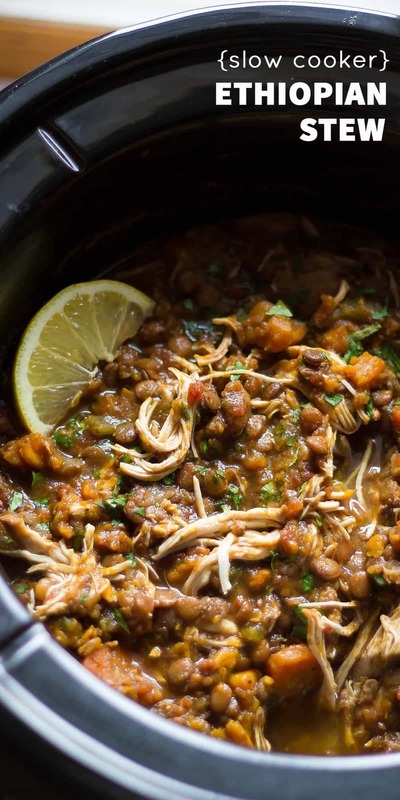 A hearty and flavorful slow cooker Ethiopian chicken stew made with Ethiopian spices, lentils and sweet potatoes. Bring some exotic flavors to your dinner table! Hi hi hi. I am posting on a MONDAY, which I rarely do, mostly because I am not normally so organized on a Sunday to get a post ready. I knew this slow cooker Ethiopian chicken stew was going to be a good idea because clearly you guys love the Slow Cooker Tuscan Chicken Stew and the Slow Cooker Mexican Chicken Stew recipes. Also, I keep getting e-mails about an Ethiopian feast post that I used to have on the blog a LONG time ago (I took it down because they are not recipes I developed myself, but if you want the recipe links, e-mail me!). So when I was thinking up ideas for more slow cooker recipes, I knew I had to revisit those bold Ethiopian flavors. Confession: I totally forgot to put the sweet potatoes in the slow cooker when I was taking that photo ^^. D’oh! Don’t skip them, they are absolutely wonderful in this recipe! This is the part where I say I am NO expert in Ethiopian cuisine…we did order some Ethiopian take-out as research because I wanted to be sure I was in the ‘ball park’ flavor-wise. So no, this isn’t traditional Ethiopian, and I wouldn’t dare call it Doro Wat…this is my spin on the flavors I enjoyed from Ethiopian recipes I’ve cooked in the past. 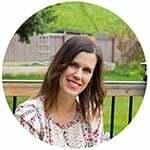 9/2017: recipe updated to include instructions for assembling ahead and freezing for an easy freezer slow cooker recipe! After a couple of dud batches, we ordered Ethiopian take-out, and it was clear: it needed some cardamom, a bit more paprika, and maybe some sugar. So I upped these ingredients and finally ended up with a batch I was happy with! I feel like I need to say this: WARNING! 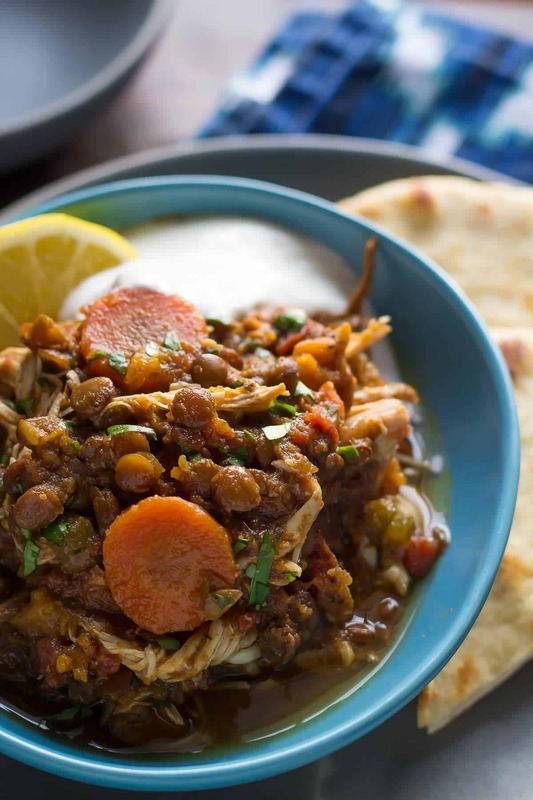 The flavors of this slow cooker Ethiopian chicken stew are BOLD, and this stew is very hearty. For that reason, I don’t recommend a very large serving size. You might want 3/4 cup max, and serve with a salad or something lighter. It’s just not the type of stew where you can eat a huge bowl. I enjoyed mine with naan bread, Ethiopian food is traditionally served on a spongy pancake-type of thing called injera, but naan worked just great! Alright! 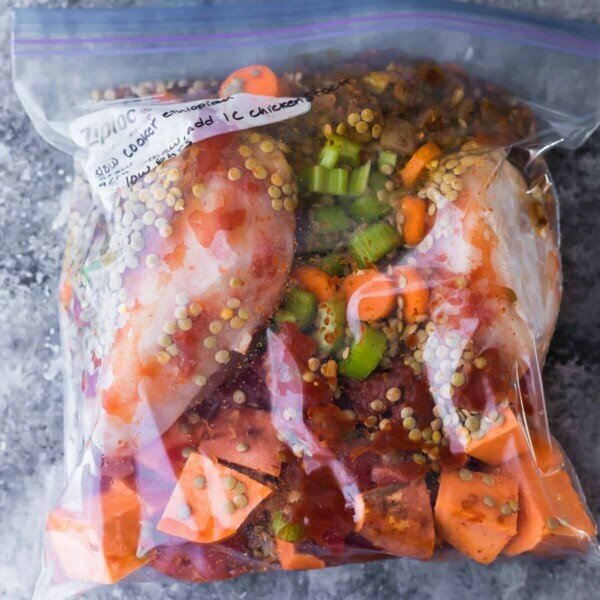 Slow cooker Ethiopian chicken stew: I can finally check you off my to-do list! Melt butter in a medium pan over medium heat. Add the onion and cook 5-8 minutes, until cooked through. Add the berbere, cardamom, paprika, ginger and garlic, and cook for 1-2 more minutes, until fragrant. Place the onion mixture in the slow cooker along with all remaining ingredients. Gently stir in the lemon juice, brown sugar, and salt (if needed). Serve with flatbread and yogurt. Follow steps 1-2 (above) and place cooled onion mixture into a gallon freezer bag with all remaining ingredients except for the stock. Remove as much air as possible and freeze for up to 3 months. Thaw completely, then place in a 5 quart slow cooker with the stock and cook as directed above. *Berbere is an Ethiopian spice blend. You may be able to find it in specialty stores, however I made my own using the recipe below. This stew is medium-spicy. If you don't like spice, you will need to reduce the cayenne/red pepper flakes in the berbere spice blend. If you want it SPICY!! then you will want to double the cayenne/ red pepper flakes. This is a very hearty stew! ¾ cup is plenty for one person. Combine all ingredients, store in a sealed container. Recipe is adapted from group recipes. This should make around 1 cup of berbere spice. This spice blend makes a medium-spicy Ethiopian stew. If you don't like spice, try halving the cayenne and red pepper flakes. If you like it really spicy, try doubling them! Hello. This sounds delicious and I am looking forward to making it. But I am concerned that the ingredients don’t sound like enough for 8 servings… Only a 1/4 of a chicken breast per person? Or is that a typo? Thanks! Hi! There is plenty of protein from the lentils in this recipe, so it is not a typo. Hope you enjoy! I’ve made this recipe so many times now in my Crock Pot and absolutely love it! I’d love to try it in my Instant Pot, do you have any recommendations for cooking time? Would I need to add more liquid ? Thank you for sharing such a delicious recipe! This recipe was easy to follow and very flavorful. My wife doesn’t like spicy food so I cutback on the cayenne and pepper flakes in the Berbere spice mix. Perfect for a chilly winter night. Thanks for posting. I’ll be making this again. So happy you enjoyed, Ralph! Thank you so much for taking time out of your day to leave a review. I am definitely going to have to try this. My children are Ethiopian but we don’t have any Ethiopian restaurants close by so we never get to eat Ethiopian cuisine. I have been too scared to try to make any myself but this seems simple enough to go for it. I am so excited!! Oh I really hope they enjoyed it! Probably not the most ‘authentic’ Ethiopian food but hopefully it is kind of close! This dish smells amazing, but I’m starting to wonder if I’ll ever get to taste it. It’s been 6 hours and it’s nowhere near done and I feel like one cup is not enough liquid. I added some more and put the crockpot on high, but there’s no telling if it will be done in time for dinner. If it’s as tasty as it smells, I may just make this in the dutch oven next time. Hi Leslie, apologies for my late reply as I’ve just returned from holidays! I hope it turned out for you. If not, could you tell me what was not done? 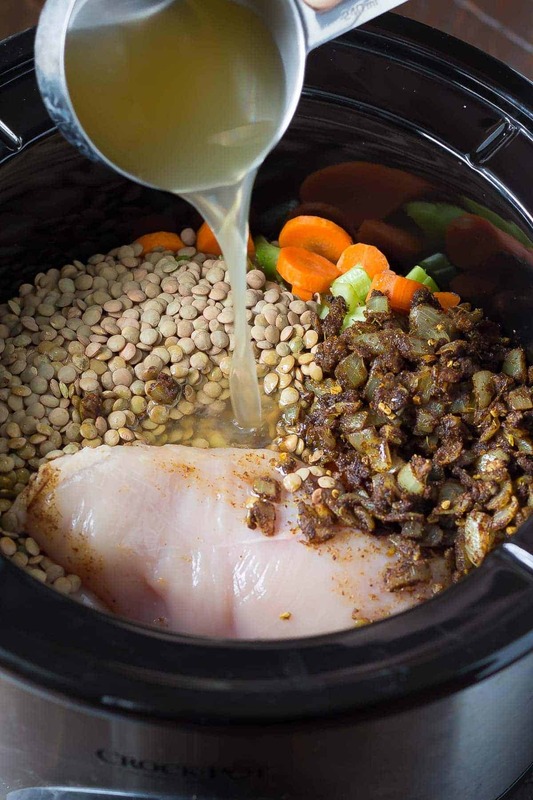 6 hours is more than enough time to cook sweet potatoes, lentils and chicken…although I know some slow cookers do cook lower and slower than my crock pot. And I just made this recipe a few months ago again, and there was enough liquid. I’d love to hear how it went for you! The lentils were not getting done. I added about a cup of liquid and an hour and half of cooking time. I know nothing about lentils, but a friend of mine was confused by the recipe because she says green lentils don’t come split. I used lentils that looked just like the pictures though so I don’t think it was the wrong thing. Regardless, it tasted great and my house guest, who has had Ethiopian food before, really liked it. I just put this in crock pot. Excited had to substitute cardigan with ginger and cinnamon,will let you know. A delicious, unusual and easy recipe. Will make this a staple. The chicken is so tender and the stew is nourishing comfort food with flair. Thanks for the recipe. I tried it for the first time, today. I thought the flavors were good, I don’t like spicy So I didn’t add in any “hot” spices. Hi Denise – I cooked this today as ‘something new’ – it was incredibly delicious and enjoyed just as equally by our two toddlers as by us adults. I love that it was really easy, really healthy and so uniquely tasty. Thank you so much! Wow, this was so good and flavorful. I’m going to make this again. I followed Denise’s oven cooking recommendations in an earlier post. I used a #26 Le Creuset round French oven and the size worked out well. This stew was a big hit at my house! I am a big fan of Ethiopian food and Injera. This stew had such a warm and flavourful taste. As much as would have liked serving it with Injera, Im not sure where to buy that so I opted with serving it with Naan bread. So delicious! This was delicious! I actually almost doubled the recipe (my crockpot was FULL), and I used butternut squash instead of sweet potatoes, and it was awesome. Super healthy too! Everyone I served it to enjoyed it. I ended up getting 8 very hearty meals out of it. The brown sugar and lemon at the end really somehow made all the spices evolve. 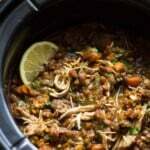 Do you have other crockpot recipes? I made this with chicken drumsticks and cooked it in a pressure cooker. 20 minutes on high ring. Absolutely delicious! Will definitely make it again. I have a question: I hate soft/mushy lentils. If I follow the recipe will the lentils get really soft or just end up al dente? I’ve never done lentils in the crockpot so I’m not sure about the timing. I’m really excited to try this – I love Ethiopian food but have never attempted to cook any myself. Hi Jessica! Since you cook dried lentils, they retain more texture than if you used canned lentils in. And green lentils are definitely less mushy than red lentils! I can’t completely remember whether they were al dente or not… you may want to check at 4 hours? (The chicken should be cooked through at that point anyway). I hope you like it! When you say “brown sugar” so you mean light brown like you use in cookies or non-processed like you put in your coffee? I hope I made sense! Thanks! Either one will work Kristine! I just used the light brown stuff. Have you ever made this on the stove top? I want to make it tonight but won’t have enough time to use the slow cooker. It looks very delicious! Thanks! Hi Lucia, I have never tried cooking this on the stovetop. I think you could do it, but I would keep an eye on the liquids and add more stock/water as needed. If you try it, I’d love if you let me know how it works for you! I just made this for dinner tonight, and it was really delicious. My boyfriend said it was one of his favorite things I’ve cooked. Thanks for a unique slow cooker recipe! Yay! That makes me so happy 🙂 Thanks so much for your awesome comment, Allison! Made it for supper. It was insanely good! Your recipe says cook time for 6 minutes. I think you mean 6 hours and total time is not 26 minutes, but 6 hours and 20 minutes. You are quite right! Thanks for the heads up! Fixing ASAP. This makes me so happy 🙂 I hope your hubby likes it! Thanks so much for the comment, Betsy! I made this last night and it was absolutely outstanding – my boyfriend was raving that it was restaurant quality! I rarely write comments on websites but I had to say something about this! I didn’t have a slow cooker so I used my Staub dutch oven at 325° for 4 hours, adding in liquid every hour after the first 2. Served over Israeli couscous – it was so delicious and healthy. Thanks so much for the recipe! Wow, thank-you so much Rebecca! Your comment really made my day 🙂 Thanks for the tips to adapt to stovetop. This is the best Crockpot Recipe I have every used! The flavor from a crockpot dish is impressive. 2 Tablespoons of Berbere may be to spicy for some, but it was fine and was a bit less spicy the next day. What a HUGE compliment! Thanks so much for making my day, Hammond! Oh this stew looks very interesting. I’ve never eaten Ethiopian food before. You should try it! SO much flavor, kind of like Indian food, but a bit different! The recipe looks delicious! I am unsure about the chicken breasts – are they cooked whole? Do they break up during the cooking process? Hi Lana! The chicken breasts become fall-apart tender while they cook. I did help them along with a couple of forks afterwards 🙂 I hope you like it! The stew was delicious, the chicken breasts (I added 3) did indeed fall apart! I will be making this again. I just made this and it’s delicious! However, I have a friend who’s vegetarian — any thoughts on making this a vegetarian stew? Should I change the liquid amounts or anything to make up for no chicken? What’s the total weight on the chicken breasts? My local selection runs 4oz to 1lb for a boneless/skinless half. Thanks! Hi Adrienne, I’m not sure what the weight of the chicken breasts was…they were quite large. You should be able to sub any size of chicken breast in this recipe. I’m allergic to cardamom, but I’m sure I can work around it. I love how comforting and satisfying this sounds, and even better, that it’s made in the slow cooker! Nice recipe, Denise. This stew looks SO comforting, hearty AND delicious!! It’s been so cold here and soups and stews are all I’ve been having so I can’t wait to try this one next! I love the sweet potatoes in here and the flavors sound amazing! I’ve never tried Ethiopian flavors before, but this stew looks amazing!! Especially thanks to your gorgeous pictures! So I’ve never tried Ethiopian food before, but now I’m wanting to make this recipe after seeing these gorgeous pictures! This looks so hearty and perfect for an easy weeknight dinner. Slow cooker recipes are the best! I’ve never tried anything like this, Denise, and it sounds and looks amazing!! I’ve been starting to fall totally in love with my slow cooker and I’ve got to try this recipe next. Sounds especially delicious with naan! My slow cooker has been putting in some long hours lately, and it’s just so much easier at dinner time! Thanks, Rachel! This stew looks so thick and hearty!! I’ve only eaten Ethiopian food once and I was surprised at how much I liked it! I also have an Ethiopian cookbook that I need to break out more. This stew really looks so flavorful and delicious! I find Ethiopian cooking SO interesting! It’s super bold like Indian flavors…but definitely different flavors from Indian cooking. I’m hooked! Thanks, Izzy! This stew looks just perfect for a cold winter meal, and the flavors sound delicious, Denise! I’m glad you perfected the recipe, and I absolutely love that you used sweet potatoes here! The sweet potatoes were a last minute throw-in that absolutely made the dish! It needed some extra sweetness to it 😉 Thanks, Marcie! This hearty stew is JUST what my Monday needs! I love a bold, chunky stew to warm me up at dinnertime and this sounds like the perfect one! That spice mix sounds amazing! !